Awright, let's be clear about something: the navigator was not listening to his iPod while at his station. But he was in his cabin listening to his iPod when he was supposed to have been at his station. Which in some ways is indicative of plenty more that was wrong on this sub. "iPranged a submarine" screams the The Sun in the United Kingdom (gotta love those wacky British headlines). 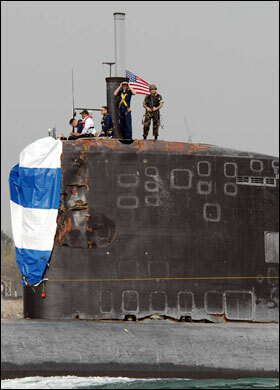 It's now come to light that the collision between the United States Navy's nuclear submarine USS Hartford and the transport ship USS New Orleans in the Persian Gulf a year ago was caused by the Hartford's navigational officer off on his own "revising for an exam" while listening to tunes from his iPod when he should have been uhhh... navigating. But wait, that's not all! Crewmen had also set up loudspeakers so that they could listen to music (presumably from their iPods) while on duty! Which as anyone who has even seen The Hunt for Red October (or better yet read the original novel) could tell you, is an act of insanity aboard a submarine dependent on multi-million dollar sonar arrays that can pick out opera singing from clear across the Pacific Ocean. The report also said that "sonar operators and radio men were missing from their posts. Others drove the attack sub while 'with one hand on the controls and their shoes off'". The Hartford's captain, Commander Ryan Brookhart, has now been relieved of duty after investigators cited more than 30 infractions which led to "an informal atmosphere" and "a weak command". Anyone else hearing the Village People singing "In The Navy" after reading this story?